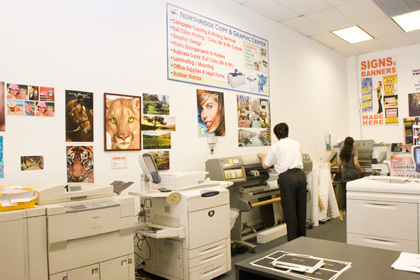 Our Los Angeles same day printing services office has a wide range of design, print, and photography options for area businesses and consumers. We work hard to complete orders on time and focus on quality as well as speed and affordability. Our team of experienced designers can create all-new designs or work from ideas that clients provide. We can also modify designs to adapt to the media that clients are planning to use for display. Our same day printing services in Los Angeles can provide full-color signs and banners, business cards, brochures, and flyers that are ideal for business promotion. Our signs and banners have multiple options for inks and materials, and business cards can usually be completed on the same day that the order is placed. Window lettering can be used to turn any storefront window into a billboard. With window perf, glass on storefronts, or vehicles can be used to advertise without impeding visibility outwards. Our t-shirt printing services use top-quality materials and are ideal for general promotion by bands and businesses as well as for company uniforms. We can also print t-shirts in black and other dark colors. There is no need for authors to send manuscripts to big publishers for printing and binding. We can print books in small or large orders with a variety of binding options. In fact, even big publishers routinely use these services for smaller printing runs. We have photographers on staff to take pictures for graduation, passports, and citizenship applications. Because our Los Angeles same day printing services office prints photos while clients wait, we help clients save time as well as money. Our experience at taking photographs for submission to government officials makes applications easier for clients. A variety of specials makes our same day printing services in Los Angeles an even better deal for area residents and companies searching for quality combined with speed. 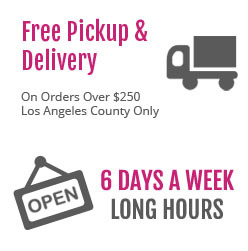 For orders over $250, Los Angeles County residents also get free pickup and shipping. Our printing office can be contacted by phone or email to answer questions about these and other services.